Dear friends! Since I love the dark evenings of the Autumn I decided to show the Knuipe in the 'evening dress' in this thread. I hope you like it! I am very sorry that you canceled your trip. I wish you a speedy recovery. We bought a small shock waves device. It helps very good against different kinds of pain. Bei uns hat auch nicht viel geregnet. Dear Mervi I understand your sadness in not coming to Berlin. In the early years of Knut I was not able to make the journey in December and then between 2012 and 2015 I was also a staybehinder. It is especially sad for me as I do not know whether I will be able to travel so much in 2019. I am hoping against hope that things will turn out okay. LUDMILA - bei uns ist es noch sehr trocken. Der Regen zieht anscheinend immer vorbei. aber die Speicher müssten aufgefüllt werden. MERVI - wie geht es Nalle heute? Ich schaue gleich bei KWM vorbei. nicht nach Berlin reisen könnt. milder - weiter kein Winter in Sicht. Ich brauchte wieder 10 Versuche, um rein zu kommen. Dear friends! Today I've had all reason to sing 'Always look at the bright side of life'. Unfortunately my ischias has got worse so we had to cancel our Berlin trip. I can't walk properly and stairs are a mission impossible. This year hasn't been a good year for zoo visits but things could be much worse ..... - The Knuipe meeting will, of course, take place as planned and I'm sure it will be a cosy evening for everybody attending! Today would have been Yoghi's birthay. Thank you, Dumba, for reminding me. I have lit a candle to the memory of our gentle bear that had to leave us far too soon. Ralph - I had hopes to see Katjuscha again but I'm sure she'll be happy meeting you and many other fans. Knuti-Judi - New tests have been made so we hope Nalle will get suitable medication for his problem. Giovanna was not always very nice to Knut. I remember how she took away the birthday ice bombe from Knut at his birthday. Knut and Giovanna had the nice time together, but there were the other moments too. On the other hand Giovanna is a part of Knut's story. Der Winter hat erst angefangen. Ich hoffe es wird genug regnen oder schneien. Just started saving November's Knutis Weekly stories. One of the things that I am struck by is how lucky we are to have Teddy Volodya in Berlin. Of course he cannot replace our special Knuti, but he is a fantastic bear in his own right and helps to fill the gap in Berlin. Watching him in the Zoo has been a real treat this year, and it is appropriate that he will be in the background next week when we gather to meet Knuti. Katjuscha did not really have a happy role in Knut's story, but she was always in my heart from my first visit. 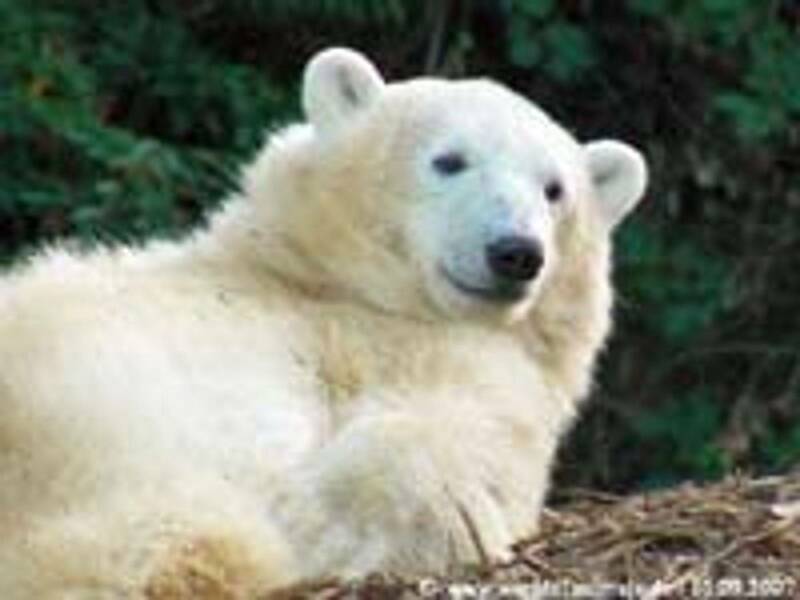 Rather like Antonia in Gelsenkirchen she was not a "sweet" bear like Tosca or Lara, but a feisty Polar who didn't care whether she was in a Zoo or not and was her own bear with keepers and other Polars. You make meine laughing about the wishes fit my Boss. I wish her a good health, but a long time for it. Vielen Dank für den Herkules und die Croissants! Sehr, sehr lecker. Good morning! Guten Morgen! Dear fluffy angel - it's raining small transparent polar bears today! Britta-Gudrun - I like to read the old stories myself, too, and I'm glad to hear you liked this one as well! Ludmila - Even Minka seems to know that the Winter season has began. 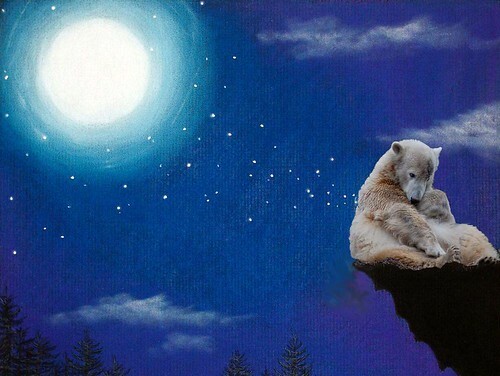 In KWM you'll find another old story telling us what a creative polar bear boy our Knuti was. He certainly had great ideas of how to raise more money to the zoo! I wish everybody a pleasant TDT! How are you and your cats doing? und wuensche einen erfolgreichen Donnerstag - bei was auch immer. 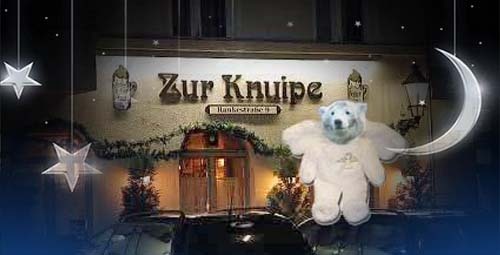 Mervi, die Geschichte von Knut als Schwarzarbeiter im KWM ist wunderbar! Let's raise our glasses to La Donna! Cheers! I hope your vet will find a way to help Nalle. I keep my fingers cross for him. Just looking in briefly to send Birthday greetings to Giovanna, who will always be in our hearts for showing Knut what being a Polar Bear was all about, and learned how to be a gentle bear and mother herself. Only a week to go before Berlin. Still lots to do here before I go. Weather forecast says rain so I will be grateful for the warmth of the bird house nearby. Happy Birthday Giovanna, mit dir hatte Knut seine schoenste Zeit! Lets have a toast to our italien lady - CHEERS! HAPPY BIRTHDAY TO GIOVANNA - OUR PRIMADONNA ASSOLUTA! Ludmila - Mimmi is doing fine but Nalle still has problems with his stomach. Teddybärenmutti - I wish you strength to get through the birthday preparations and the celebration! Britta-Gudrun - The Novosibirsk Zoo looks wonderful and there's no doubt the polar bears love the snow and the ice. Knuti-Judi - Mother Nature is very generous this year! Chris - The red panda cubbies are sooo cuuuute! Congratulations to the Belfast Zoo! - We have no snow in Malmö but yesterday morning there was frost on the ground. Even that made me glad! LUDMILA - hier ist es auch sonnig. Ich war am Main mit dem Rad. Es waren viele Gänse dort. MERVI - have you snow in Malmö ? TBM - alles Gute für die Feier !